The San Diego Derby Dolls All-Star season is in full swing! 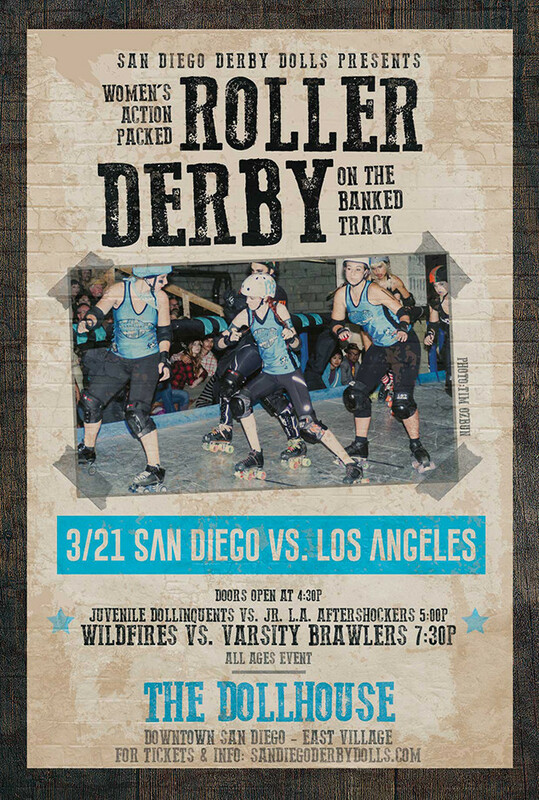 Watch the Wildfires, SD Derby Dolls All-Star travel team, take on the LA Derby Dolls from Los Angeles, CA on the banked track at the exclusive Derby Dolls' downtown facility on March 21st, 2015. This will be a double header event featuring an opening bout with the Juvenile Dollinquents, San Diego's Junior All-Star team as they too take on the Los Angeles Derby Dolls. The San Diego Derby Dolls All-Star season is in full swing! 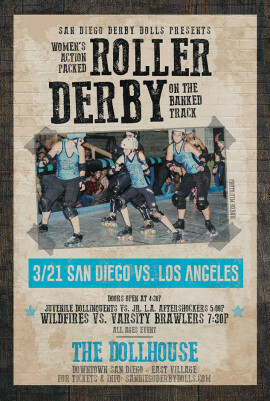 Watch the Wildfires, SD Derby Dolls All-Star travel team, take on the LA Derby Dolls from Los Angeles, CA on the banked track at the exclusive Derby Dolls’ downtown facility on March 21st, 2015. This will be a double header event featuring an opening bout with the Juvenile Dollinquents, San Diego’s Junior All-Star team as they too take on the Los Angeles Derby Dolls. This is a private event, open to only 200 of our closest friends and held in our PRIVATE Dollhouse roller derby facility in downtown San Diego! You will receive a confirmation e-mail with the physical address after you complete your order. Free street parking is available. All ages are welcome. $20.00 Bleacher Seat – This ticket is for any person of any age who would like bleacher seating. This ticket guarantees you a seat at the event though you are also welcome to enjoy the event from Standing Room if you prefer. $15.00 General Admission – Standing Room only. Very limited handicap and elderly seating. $7.50 General Admission Child – Standing room only. For children ages 5-12. Kids under 5 are free. There will be a concession stand selling snacks, pre-packaged food and drinks. Bronx pizza will also be available!! No alcohol will be served. No outside food or beverage is allowed in the facility. Our venue is not fully ADA compliant, but we’re willing to help you out in any way we can! Unfortunately, we will not be able to accommodate guests in wheelchairs. When ordering tickets, please let us know if you require any sort of assistance. Tickets are NON-REFUNDABLE. We are unable to process any refunds or credits for unused tickets. NO OUTSIDE BEVERAGES ALLOWED – ANYONE WITH OUTSIDE BEVERAGES WILL BE ESCORTED OUT OF THE DOLLHOUSE AND WILL NOT BE ALLOWED RE-ENTRY!